When I decided to start collecting Jimmy Howard stuff a few years back, he had gone from being just another Wings "goalie of the future" to the go to guy when Chris Osgood faltered during the 2009-10 season. Before that, I was aware of his presence as a prospect in the system, but not much more than that. Ever since he was drafted, there had always been high hopes for him, but nothing really materialized over four seasons bouncing between the Grand Rapids and Detroit. Even after he'd taken over the starting gig, a lot of people in Detroit were skeptical of Howard being the long term number one goalie, at least that's what it always seemed like. At the games, in the media, everywhere there still seemed to be many doubters. I think that's changed by now, especially now that Jimmy can add an All-Star game nomination and start to his increasingly impressive NHL resume. Even I didn't think he would be an All-Star when the season started, I mean even with back-to-back 37 win seasons, Howard was not really considered a top goalie in the league. I obviously stand corrected now as he made his first All-Star appearance this past weekend. One thing that's pretty neat about this is how he was "helped" into the game in part thanks to a "Vote for Howard" campaign held by a local radio station here in Detroit. Click here to check out the story. 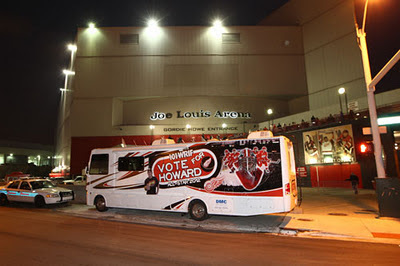 They even had a giant RV with the slogan plastered on the sides driving all around the city, take a look below. Here's a cool moment from the skills competition where Jimmy took on Jonathan Quick of the Los Angeles Kings in the goalie race. While he didn't win the race, it was still pretty neat to watch. I've played a bit of goal in the past, I can't imagine having to skate full steam like that with all that gear on. I'd be worried about wiping out. Other than the fact that Howard was the starter for Team Chara, the highlight of the game would have to be his stop on Steven Stamkos' penalty shot attempt, only the second one in All-Star game history. Stamkos tried his spin-o-rama move, but was denied. 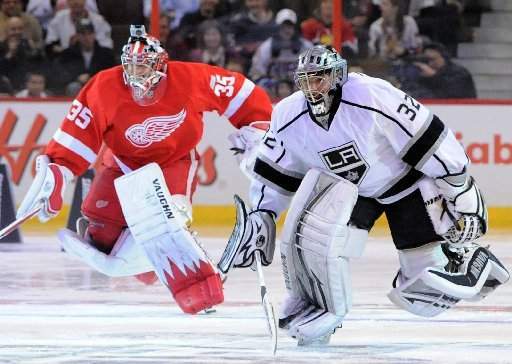 Sometimes things take a while to work out the way you want them to, and Jimmy Howard is the perfect example of that. He was drafted by an organization that likes to keep their top prospects in the minors until the right time comes along. When that time came, Howard fit right in as the number one goalie and hasn't looked back since. The only downside to all of this, the price of his cards is going up and up every day. Every now and then you come across a card where something just doesn't seem right. This pick is definitely one of those and has an error that I didn't even notice for the longest time. 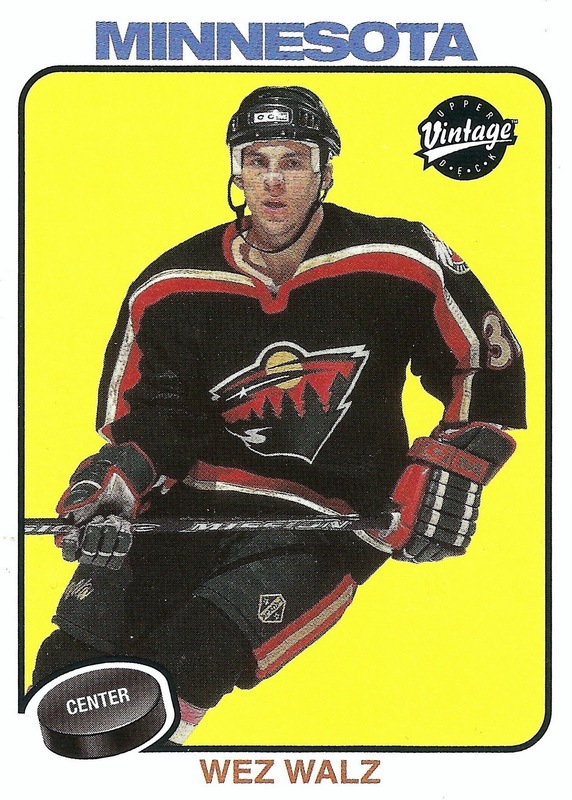 It's a Wes Walz from 2001-02 Upper Deck Vintage. This set was the second iteration of UD "Vintage" as it followed the 2001 version that was competing with Topps Heritage. Now that was a great looking "vintage" set. This one not so much. I think it may just be this card, something seems off about a Wild jersey paired with a "vintage" card design. If it were an Original Six sweater, I may think differently. 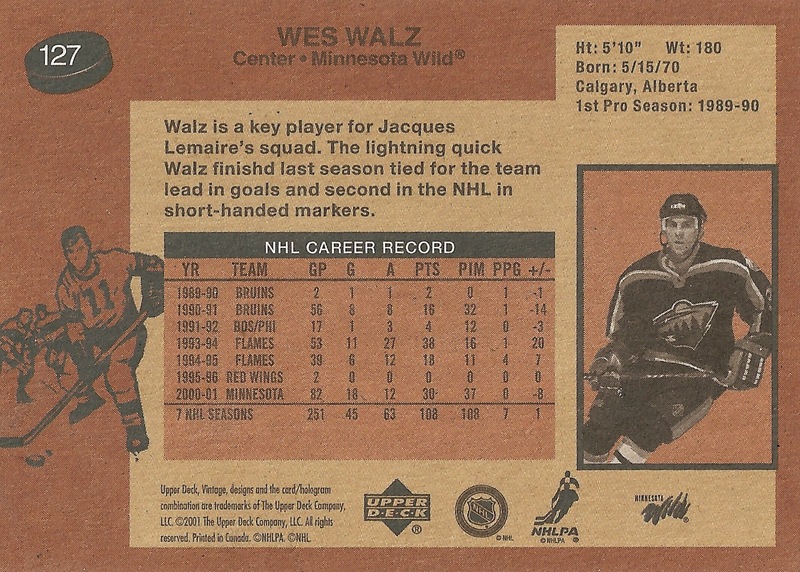 Anyway, if you look at the bottom of the card, you see "Wez Walz" written. Hmm, that seems a little odd doesn't it. The correct spelling, Wes, isn't all that common of a name as far as I know, so how does it get misspelled like that? 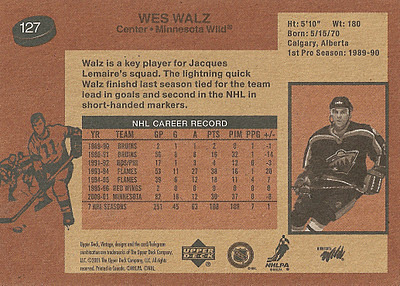 Was it because of the "z" at the end of Walz, and the designer somehow subconsciously thought it looked better that way? Here's a look at the back of the card, where Wes' first name is actually spelled correctly. Not sure what happened on this one, as the front is wrong, but the back is right. I guess nobody's perfect and this one slipped by the quality control process. Designing and editing cards is something for which I would love to know how the process works. Is there one person who does all the work for a given set, and how do they go about proof reading / spell checking everything? How often does something like this get by? Hey, I could start another mini-PC project of cards with misspelled names on the front. Nah, I better leave that for someone else, I'm already busy enough with my other projects. So someone feel free to steal that idea and run with it. By the way, do you guys have or know of any other examples of misspellings like this? It's been a while since I've had an update for this set, so I'm definitely glad to be able to knock one more off the want list. This is one of two I was bidding on and the one I was lucky enough to get with my opening bid. 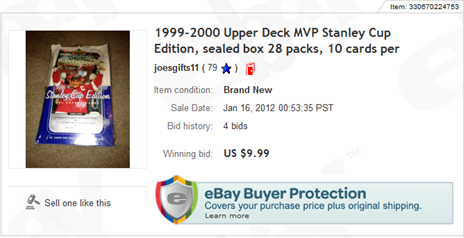 The other was a Jarome Iginla and I ended up losing it in the closing seconds of the auction. Oh well, I'm happy with just one for now. I was lucky enough to grab this one for just $8 plus $2 for shipping. That's about in line with the average I've paid for the rest of the Super Scripts to date. This one is the 23rd I've picked up now and the third San Jose Shark, along with Mike Rathje and Alexander Korlyuk. You may have seen on his blog already that Justin (from The Hopeful Chase) and I worked out a trade recently. He received his end of the deal and now I've got mine. It started as a 1-for-1 swap of the Certified Mirror Blue parallel of Lecavalier and a Jimmy Howard red border rookie from Beehive. Well, it turned into a multi-card deal and in return for sending a few unwanted Bolts cards his way, I got some excellent additions to my Red Wings PC. This is a great looking card. It's extremely simple and the red border works very well with the red and white of the Wings uniforms. The only aesthetically unpleasing thing about this card is the mask, but it's hard to complain when it was all he had to wear when getting started with the Wings back in 2005. Great card, thanks again Justin! When I bought my last box of MVP Stanley Cup Edition, I knew going in that there was little to no chance of pulling any of the Gold or Super Script parallels. I've done two boxes in the past and got nothing. In fact, the two Super Scripts I did pull back in the day, came from two random packs at the LCS. This is a nice pull for me, especially because he's a local guy, from just a few miles away from where I grew up. Player-wise I don't really care who I get, that's the beauty of building a set. I can't get upset if I pull a scrub versus a Steve Yzerman or something, they all have their place in the set and are equally important. This one brings the Gold Script portion of the master set to 36/220. It may not seem like much progress, but I've got all the time in the world and I don't like to overspend on them, so it may take a little extra time, but it will all be within a budget I set for myself. The first thing I'm going to say here is I'm glad my latest eBay gamble didn't backfire on me. If you saw my last "Thoughts" post then you know I bought this box on eBay for just $9.99 plus a few bucks for shipping. That's about 25% of what I paid for the last one, the seller only had 80 some total feeback, and the listing showed the box was slightly damaged. Well, when I got home yesterday there was a large shipping box waiting for me. I knew it was this box and was kind of nervous to see what was actually in there. I opened it up to find the box far more damaged than shown in the listing, which definitely worried me. I mean one end of the box was completely ripped open. I was worried packs were going to be missing or have been tampered with. Luckily, that was not the case as I counted them up and all 28 of them were there and seemed pretty safe. That was a huge relief because the last thing I wanted was to have to start a mess with the seller and open a complaint and all that jazz. That last one is the best of the bunch, and the first Gold Script I've actually pulled myself, from any of the three boxes or other loose packs now. Other than that I feel like this was a pretty good box, especially looking at some of the odds on the inserts. 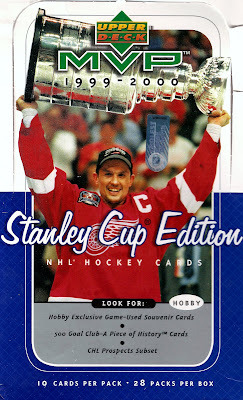 Out of this first group, the Yzerman Golden Memories is probably my favorite, along with the Kariya Playoff Heroes. These bring me to 2/10 for Playoff Heroes, 8/10 for Golden Memories, 6/10 for Clutch Performers, 4/10 for Second Season Snipers, and 18/20 for Cup Contenders. Not a bad group of inserts if you ask me. This time around I ended up only getting 15 Silver Scripts, 10 of which I needed for the master set. That's perfectly fine with me though, as the one Gold Script more than made up for that fact. When it was all said and done, I was pretty impressed with this box. I didn't really expect to get this many cards that I actually needed for my master set. This pick is just another one of those cards that caught my eye when I was sorting through my base card collection. It's a Blaine Lacher (anyone remember him?) 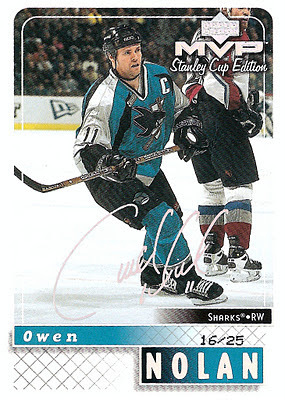 base card from the 1995-96 Fleer Metal set. 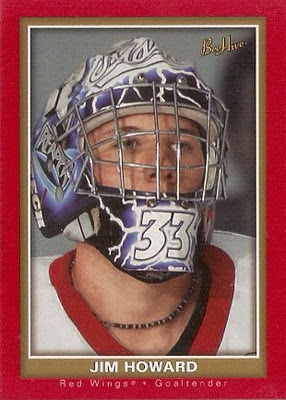 This card is probably more about the mask than anything, as it's one of the better ones from the 90's. Lacher went undrafted and after two superb seasons with Lake Superior State of the NCAA was signed by the Boston Bruins. 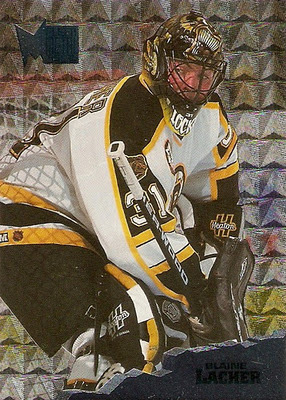 There he took over the starting job during the shortened 1994-95 season, helping the Bruins into the playoffs. For a little more about Lacher, click here to check out a great "Absurd Goalie Monday" post over at The Strangest One of All. This set was the precursor to the Metal Universe set I've been working on building. The biggest difference between the two is that every card in the 1995-96 version had the same background design. While it's nice, it's not even close to the Metal Universe design. As far as the mask on this one, it's pretty cool and one of my favorites of the 90's. Here's a better look at the mask itself. I couldn't really find a decent closeup of either side of the mask, but that's alright as the most important part of the design is prominently displayed. 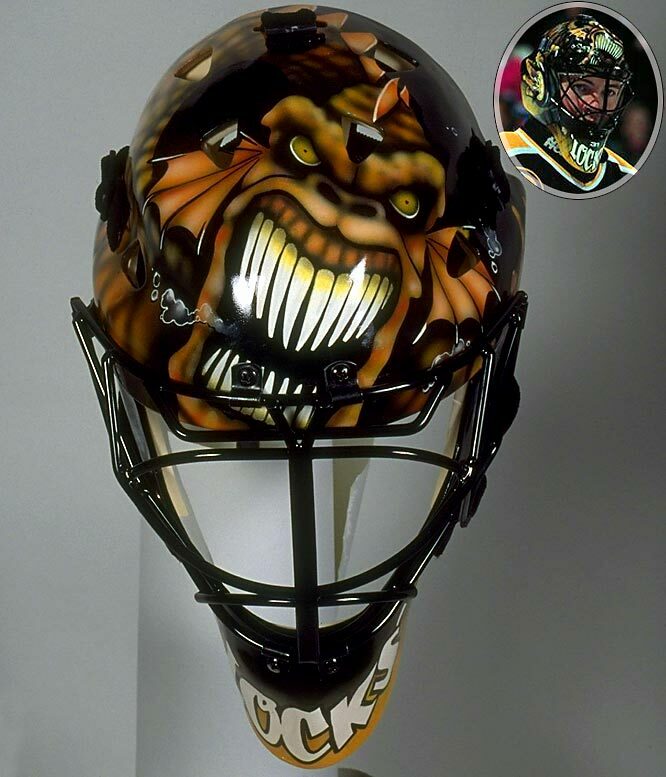 It's hard to beat having a nickname that can be represented like this on a mask. Can you guys think of any other goalies who've had anything similar in the past. The first one that comes to mind is Ed "The Eagle" Belfour and his famous mask design. Like a lot of others in the world of sports card blogs, I try to stay away from any kind of political or social issues and stick to what it's all about, the cards. However, when something comes up that could affect every one of us, I don't want to remain silent. I won't get into too much detail, but SOPA/PIPA are both bad news for us bloggers, so do yourself and the rest of us a favor and first find out what it is, and second do something about it and contact your congressperson. Night Owl said it best, "I like my blog ... please let it live." The last post in this series had a common theme, and this one is no different. As you probably deduced from the title, they all feature goaltenders from the Minnesota Wild. I found four of them grouped together in my stack of cards awaiting to be scanned. 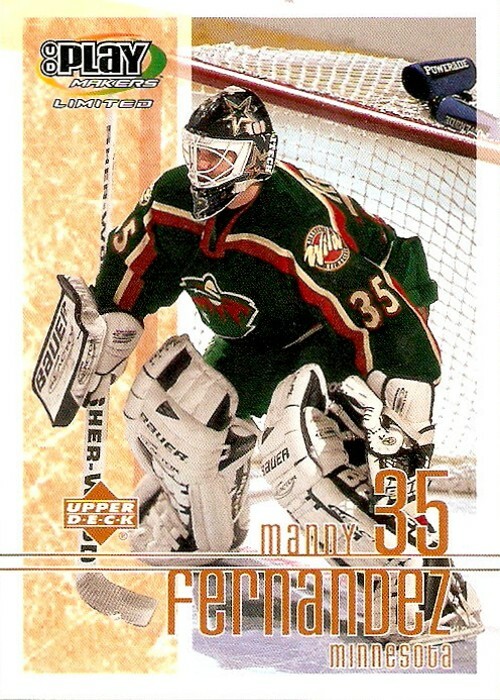 The first one is this Manny Fernandez from 2001-02 Upper Deck. Fernandez was traded to the Wild from Dallas in June of 2000. If you look closely, you can see Stars logos on the side and chin of his mask. I believe the pads/gloves are also from his days in Dallas, but they don't contrast the Wild green all that much. This one is pretty much the exact same thing, only from another angle this time. One thing I will say is I really miss those jerseys. 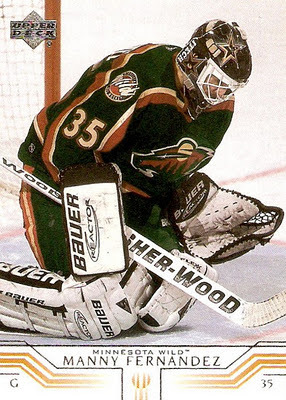 Before the edge-ification at the hands of Reebok, the Wild had some of the coolest jerseys in my opinion. I even had a home white version when I was younger and loved it. 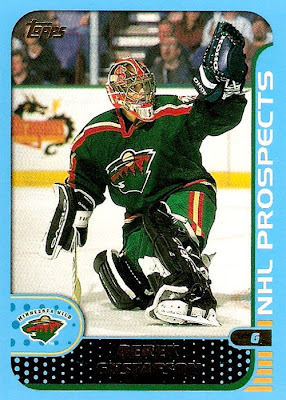 Here we've got a bit of a lesser known goaltender, Derek Gustafson, who went undrafted and only played in five NHL games over two seasons with the Wild between 2000-2002. The reason he's included here is the mask he's sporting on this one from 2001-02 Pacific. 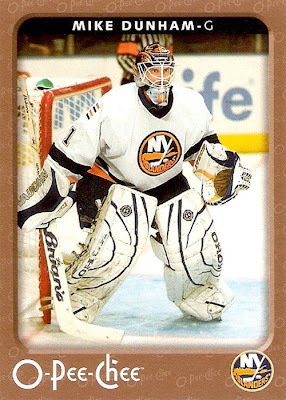 It's from his time with St. Lawrence University (ECAC), where he is best known for a record setting four-overtime win against Rick DiPietro and Boston in the 1999-00 playoffs. Not sure if anyone else noticed this, but isn't it kind of odd that Gustafson has Eagle leg pads and blocker, but then a Koho glove? I'm sure it was just a personal preference thing at the time, but for some reason something always seems off when the brands don't match like this. I mean, don't these things usually come in sets? Here's one from 2001-02 Topps. That's it for now. These four were welcome additions to the project from a collection of cards that would otherwise never see the light of day, let alone their own post on the blog. They also bring me four closer to my goal of 100 cards for the project. Only 44 to go. How many times have you been sitting on an eBay auction until the very end with the highest bid, only to be outbid at the last possible second, even when you though your max bid was enough to ensure you don't lose? Well, this happened to me the other day with a lot of MVP Stanley Cup Edition cards I stumbled upon during one of my daily searches. The title of the auction was not very descriptive of what the lot actually contained. It said something along the lines of "Lot of 11 MVP SCE Inserts/Parallels." It mentioned nothing about the five Super Script "parallels" that were actually listed in the full description. I thought this was great, it was a mislabeled listing that not many people would likely come across, plus it was at $0.99. The only problem was the six days left in the auction. Fast forward to the other night. I was watching the dwindling auction time on my mobile eBay app and thought I was in the clear with only several minutes left and no other bids above my initial $0.99 opening bid. Well, that all went out the window sometime between 1s and 0s left on the auction clock. 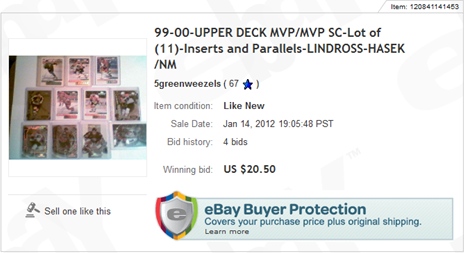 I was "sniped" and outbid by the typical $0.50 increment. Not sure if it was a legitimate bid or not. I'm leaning towards not because it popped up with half of a second left, although I guess it could just be someone with quick hands on the mouse, right? What do you think? And how often does this happen to everyone else? This post isn't all about the bad, like I said you win some and you lose some. After losing the lot of Super Scripts, I was back searching the bay and came across something I've been looking for now for quite a while. It's another box of MVP Stanley Cup Edition. At this point I've opened two of them and have nearly two complete base sets (one for the master set and one for my Inkscript project). I know it's not the smartest idea to buy a box like this hoping to hit a decent insert or parallel (i.e. Gold/Super Scripts or any of the Game Used Souvenirs) but I can always hope, right? Anyway, last time I purchased a box of this stuff on eBay it cost me $29.99 plus $15 shipping, a bit much but well worth it for the fun of opening it and making a decent dent in my master set project. This time, I found one listed for only $9.99 plus $4 for shipping. Fast forward to around 3:45 AM today and I won the auction with my one initial bid of $9.99, awesome. Now I'm just waiting for it to show up. So, sometimes you win and sometimes you lose. I may have missed out on a nice lot of inserts, but I think I won big with a great deal on another hobby box that should be a load of fun to open. Stay tuned for another box break post once it arrives. Back when I started this project, the first thing I did was sort through all of my three-ring binders and monster boxes of base cards looking for the perfect candidates. Well, I ended up with a stack of about 40 cards, a lot of which I've already shared as part of the project. Without anything else to post for today, I decided to take a look through what's left of the stack and found three cards that have one thing in common: mismatched masks. I know that's stating the obvious when it comes to this project, but there's something to be said about three random cards for which the only discernible reason they're here is the exact same thing. If you look at all three, the mask is the only piece of equipment that doesn't match, although I guess that could be questionable with the second one. Anyway, the first one is this Rick Tabaracci from 1997-98 Score. 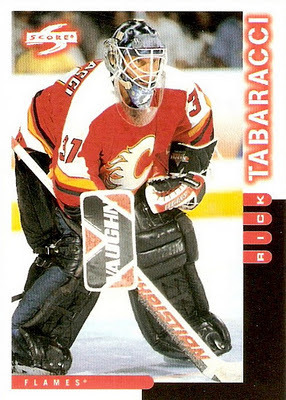 As you can see, he's playing for the Flames in the picture, but the mask from his time in Tampa Bay remains. Other than that, he's got matching glove and blocker, and I'm guessing the all black pads were just a carry over, but I can't find any pictures to confirm that. 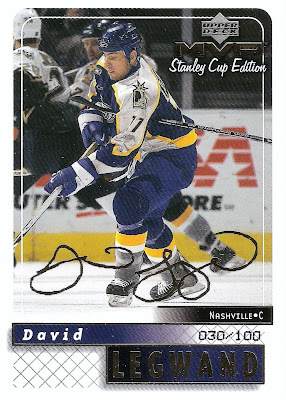 The second is this Mike Dunham from 2006-07 OPC. 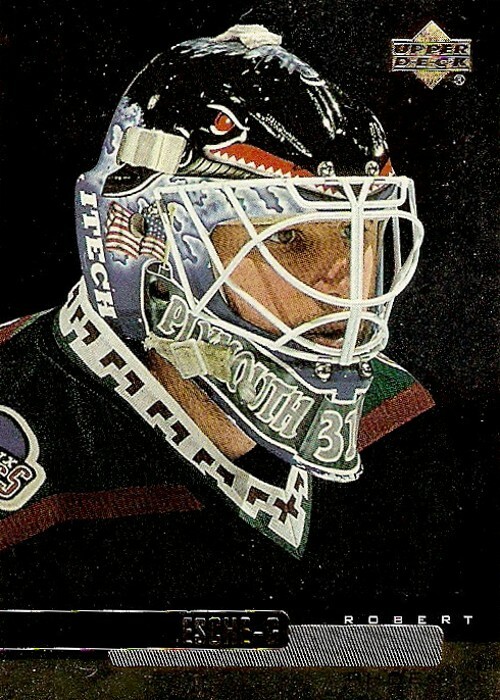 As you can tell from the mask in the picture, Dunham played in Atlanta before signing with New York in September of 2006. The only other minor mismatch would be his glove, as the rest could go with either Atlanta's or New York's color schemes. The third, and most blatantly obvious of the three, is this Robert Esche from 1999-00 Upper Deck. I really like this one because it's got a close up of the mask, yet you can still clearly see the Phoenix uniform and know that something isn't right. That's because he's wearing a Plymouth Whalers mask from his days in the OHL. Here's a little something fun: my high school graduation was held in the same ice arena (Compuware) where the Plymouth Whalers play. Kind of cool that I shared the same venue as this mask for a day. That's it for now. I've got one more of these posts lined up with a few more cards from the original stack I have left, so look for that in the coming days. Until then, I'm just glad it's the weekend and I have another roller hockey game to look forward to on Sunday, plus I get to try out my new Reebok 5K stick and 7K gloves for the first time. I thought two weeks of vacation over the holidays would've given me more time for this blog, but in reality it gave me less (travel, family gatherings, etc.) so I want to get caught back up on a few posts I started before the break. 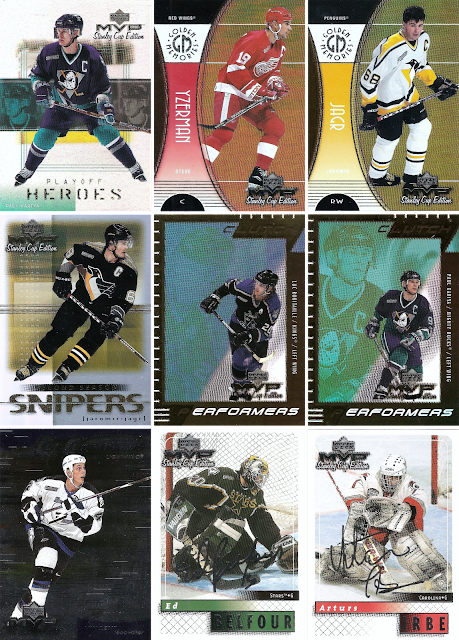 This one adds another PC project to the blog, which as you can tell by the title is going to be the 05-06 UD Hockey Showcase set. 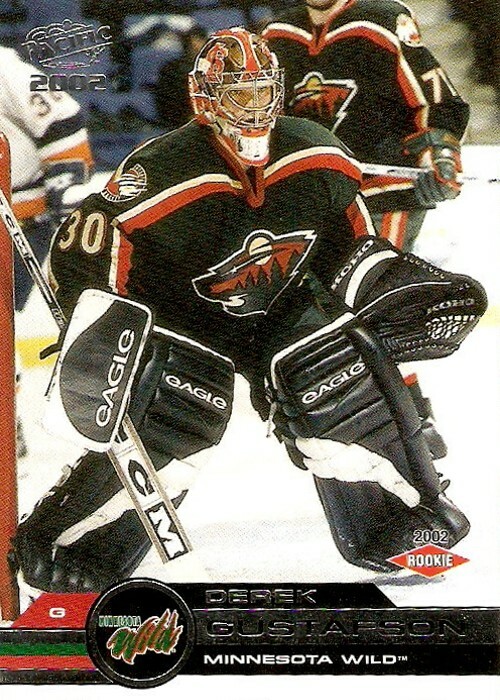 A while back you may have noticed one of "my picks" featured the Chris Osgood card from this set. It's a great looking set, especially considering it was a NPN (no purchase necessary) redemption program UD held around the beginning of the 2005-06 season. I think is was meant to be a nice gesture by UD to fans of the game, or something like that. There are 36 cards in the Rookie Showcase set and 40 in the Hockey Showcase set. Where this will get interseting is the parallel promo versions that are out there. Apparently, you could get the promo versions in copies of Beckett Magazine. The only difference between a promo and regular card is the color of the inner background. I've read in several places that the darker "bronze" is the regular and the lighter "pewter" is the promo. Any of you guys know anything about it? You may have also notices that I added another tracker to the sidebar of the blog for this project. It looks like it's just for the Hockey Showcase set, but I'm lumping in the Rookie Showcase set so I don't need to mess with two separate trackers. One of these days I'll scan in the one's I have so you guys can get a bit of a better look at the set, plus that way I'll be able to know all that I've got and what's left on the wantlist. Until then, if you've got any of these you are willing to part with, drop me a line and I'm sure we can working something out. By the way, did any of you guys take part in this NPN? Have you ever been in a situation where you've got a player collection and a set collection project that overlap? 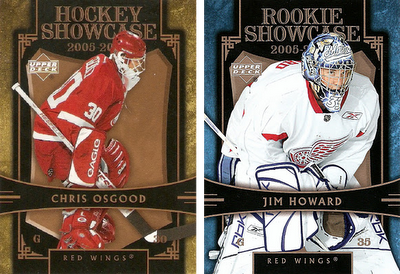 I am right now with one of my recent Jimmy Howard pickups, from the 2005-06 Upper Deck Rookie Showcase set. I should back up here for a second and say I've started, or really continued, another PC project and by that I mean I'm building both the 05-06 Hockey and Rookie Showcase sets from Upper Deck. I'll explain more about that in another post here soon. So back to the dilemma. I bought the Howard Rookie Showcase card for my Howard player collection, before I decided to add the Rookie Showcase to the set build. Now that I've added that set, do I let this one card do double duty and hold a place in each project? Or do I go out and get another one for the set? Anyone run into this problem before? I know whatever I want to do is all that matters when it comes to my personal collection, but I wanted to get some feedback on this issue anyway before proceeding.